This is the budget to use for estimating the cost of a feature-length film and presenting those figures to the people who will be financing, insuring or distributing the production. Fine-tuned and perfected using 30+ years of actual production experience, it's a comprehensive check list of all the necessary expenses from beginning to end. It's also a versatile tool for fine tuning and adjusting a film budget. EASY BUDGET can be used to estimate budgets ranging from next-to-nothing to hundreds of millions of dollars. Truly simplifies the estimating process for you - no matter the budget size. You’ll create budgets much faster than with any other program. Easy Budget knows when a particular labor contract provision benefits you and automatically makes the most cost-efficient selection. 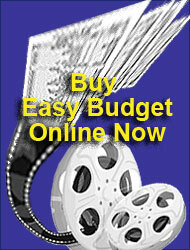 This exclusive "Intelligent" feature can save you thousands of dollars on every film. With Easy Budget you don't need to spend a lot of time learning how to use the program - start creating your budget right out of the box. You'll never need to take a class to use Easy Budget. Years of priceless production experience combined with our fill-in-the-blanks convenience means you’ll never forget something important. Our easy-to-follow instruction manual and online labor database supplies all the hard-to-get information for you. High quality graphics - you can’t buy a better looking or more impressive budget anywhere. Designed to leverage the powerful features of the spreadsheet you probably already own. You can easily compare changes - no need to create another budget just to test for a what if? Just make your correction and instantly see the change as it is applied to the entire budget.. Unlike the more expensive programs, you're never more than one click away from any account page. No need to navigate complex layers of accounting just to make a simple change. And no more blank pages like all the other programs! The many ingenious production “tips” contained in the instruction manual will make you look like an expert even if you're not. Very easy to customize - fit the budget to your film. Change from dollars to euros, to pounds or yen with one click. 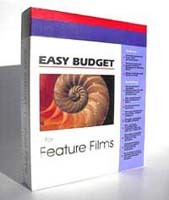 Easy Budget's practical, polished format and comprehensive content are appreciated by investors, studios and bonding companies.